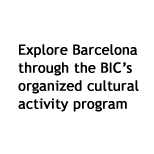 When it comes to investing your time and money in a study abroad program, it's only natural to want the very best and the Barcelona International College (BIC) guarantees you just that. You will be able to enjoy the exciting academic atmosphere of a university in Spain while expanding your mind with a special study abroad program designed in accordance with our international students' interests and needs. With an unrivaled location in the heart of the cosmopolitan city of Barcelona, the BIC campus is a truly multicultural setting. Here, you and other international students from dozens of countries will have take advantage of the incredible opportunity to dramatically improve their Spanish language skills while earning college credits with our diverse range of courses. The BIC campus boasts sleek, modern facilities that help create a stimulating academic atmosphere in which students are encouraged to expand their minds. Classrooms are spacious and luminous, not to mention equipped with multimedia equipment, and as a BIC student you will also have access to a library stocked with materials that you can consult. 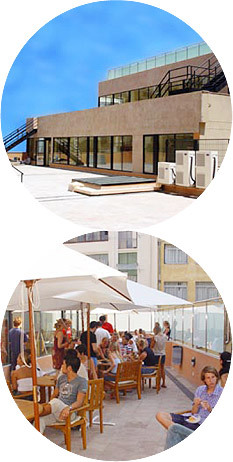 As a BIC student you will study in the center of Barcelona in the L'Eixample neighborhood, famous for its numerous Art Nouveau buildings designed by Antoni Gaudí. The Plaza España and Plaza Cataluña, two major hubs of town, are within short walks of the school, and you will also have easy access to numerous metro and bus lines that will be key in discovering and exploring Barcelona's many diverse neighborhoods. However, the ideal campus experience is a combination of academia and leisure, where an open community atmosphere fosters friendship and solidarity between students and teachers. For this very reason the BIC campus boasts numerous common areas that you can use to study, relax and socialize. On-campus cafés provide laid-back places to relax and refuel with a snack or drink, while our magnificent roof-top terraces - perhaps the most spectacular part of the BIC campus - is ideal for hanging out with a book or simply enjoying the famous Mediterranean sunshine. Check your email or surf the web in our computer lab, or bring along your own laptop and take advantage of our high speed Wi-Fi available throughout the campus facilities.